My name is Brandon Nickens and I'm a Casting Producer at Studio Lambert, the TV production company behind hit shows such as Undercover Boss. We're currently casting for a very exciting new reality series for Netflix called The Circle US. 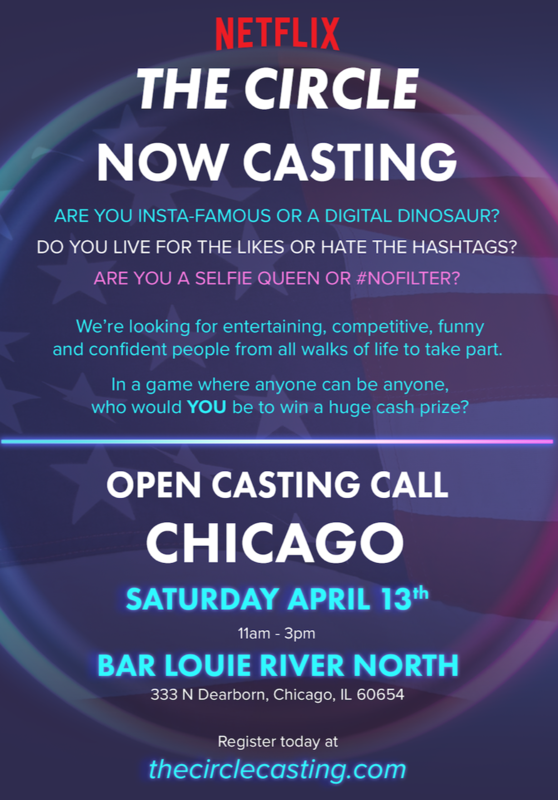 I'd love your help spreading the word, as we'll soon be holding open auditions in Chicago from April 10th through April 15th. In the show, contestants will compete against each other to be deemed the most popular and be in with a chance of winning a HUGE CASH PRIZE! Contestants will all reside in one building, but will live in separate apartment blocks and can only interact with each other through a voice-activated social media platform called The Circle. They'll get to know each other through what they choose to upload onto their profiles and what is shared in their online chats with other contestants. They will regularly rank each other, with the most popular gaining rewards and power, whilst the least popular are punished or even blocked and removed from the game. We're scouring the country for the most confident, competitive and funny big characters to take part, and we would love to let Americans nationwide know about this exciting opportunity! Check the flyer out for information if we will be in your city. You can also find us on Instagram & Twitter @CastTheCircleUS and share our flyer from there. Please also forward this on to anyone you think might be brilliant on the show, or if that is you then please apply. It would be great hear back from you, and if you need any additional information please don't hesitate to get in touch.